Arnold Stegen MD of Aquellé said, "This is a huge honour for us." He added, "It is fantastic recognition and we are thrilled." aQuellé is dedicated to delivering an innovative, affordable and genuine brand of water, synonymous with high standards of product excellence. With aQuellé being 100% FOR PEOPLE, the company is committed to uplifting the community. Due to the incredible increase in the demand for aQuellé, it has been necessary to continuously expand the bottling plant and transport facilities. The plant has expanded from a mere 280 square meters in 1998 to over 18 000 square meters to date. To keep up with the increased demand, aQuellé acquired a bottling plant in scenic Franschhoek in 2016 and extensions are well underway to expand the plant, add new machinery and warehousing. aQuellé is a communitybased organisation that has the interests if its people at heart. 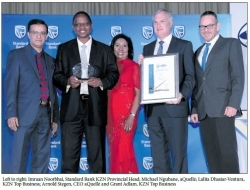 The company is involved in a broad spectrum of community projects including support of a HIV/Aids care center, local feeding scheme for orphaned children and bursaries to dozens of school children in the area. aQuellé also provides fresh drinking water to the local community and is involved in various farming initiatives with the assistance of equipment, materials and training of the local people in a full range of farming skills. Royal Tent & Tarp manufactures and sells a wide of tents from marquees and high-end Bedouin and stretch tents for functions and weddings, to robust, durable tents for disaster relief, military use and even warehousing. Husband and wife team, Muktar Mahomed and Zayeeda Suleman have a fundamental business philosophy that what you put into a business is what you get out. They have painstakingly built up a large loyal client base over the years, and have long-standing relationships with suppliers too. Southern African Shipyards, Africa's leading commercial and naval shipbuilding and ship repair company, has made major leaps and bounds towards employing the concept of the collaborative economy in the execution of its shipbuilding and ship repair projects. The recently awarded multibillion Rand contract to build a Hydrographic Survey Vessel (HSV) for the South African Navy represents one of the most complex projects to be undertaken in the African continent in recent years. The vessel will replace the Navy's SAS Protea, which has been in service for 45 years. Southern African Shipyards was judged the worthy winner of the worldclass and sought-after tender, which will further establish the company as a shipbuilder of note. It will mean that work is guaranteed for the Southern African Shipyards workforce and sub- contractors for at least three years and this will once again provide a welcome boost to the local economy.